The Senate Committee on Environment and Public Works (EPW) voted 11-10 along party lines Tuesday to advance the nomination of Andrew Wheeler to be administrator of the Environmental Protection Agency. Ethanol organizations are continuing to call on Wheeler to take immediate action on approving year-round E15 and reallocating ethanol blending obligations lost to small refinery exemptions. The Iowa Renewable Fuels Association (IRFA) sent Wheeler a poster-sized letter signed by hundreds of 2019 Iowa Renewable Fuels Summit attendees asking him to keep President Trump’s promises to rural America. IRFA Policy Director Nathan Hohnstein is pictured here holding the signed letter. American Coalition for Ethanol (ACE) CEO Brian Jennings wrote to senators last week urging them to get Wheeler’s promise he will finalize a legally-defensible RVP rule for year-round E15 by summer, and reallocate waived ethanol blending obligations. 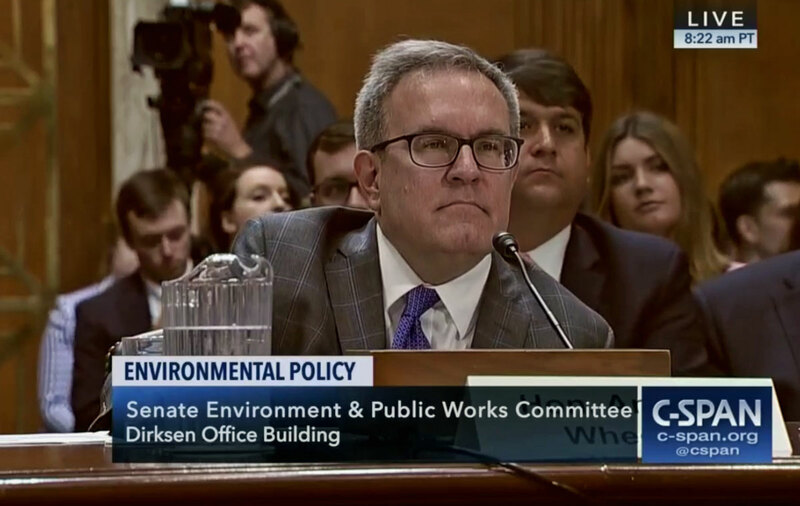 “As the full Senate takes up his nomination, it is critical for the Acting Administrator to repair the damage done to renewable fuels by his predecessor,” said Jennings. Wheeler has been the acting administrator at the EPA since July of last year, when former administrator Scott Pruitt resigned.